Museums and landmarks devoted to science, culture, and area history are located throughout the city. Several lie along the Arkansas River west of downtown, including the Exploration Place science and discovery center, the Mid-America All-Indian Center, the Old Cowtown living history museum, and The Keeper of the Plains statue and its associated display highlighting the daily lives of Plains Indians. The Wichita-Sedgwick County Historical Museum in downtown Wichita occupies the original Wichita city hall, built in 1892. The museum contains artifacts that tell the story of Wichita and Sedgwick County starting from 1865 and continuing to the present day. Nearby is the 1913 Sedgwick County Memorial Hall and Soldiers and Sailors Monument. East of downtown are the Museum of World Treasures and railroad-oriented Great Plains Transportation Museum. The Coleman Factory Outlet and Museum was located at 235 N St. Francis street and was the home of the Coleman Lantern until it closed in 2018. Wichita State University hosts the Lowell D. Holmes Museum of Anthropology. The Kansas Aviation Museum, housed in the Terminal and Administration building of the former Municipal Airport, is located in southeast Wichita adjacent to McConnell Air Force Base. ^ a b "American FactFinder". United States Census Bureau. Retrieved December 7, 2014. ^ "Kansas: 2000 Population and Housing Unit Counts" (PDF). United States Census Bureau. July 2003. p. 46. Retrieved January 20, 2011. ^ "Grove Park Archaeological Site". Historic Preservation Alliance of Wichita and Sedgwick County. Retrieved March 21, 2015. 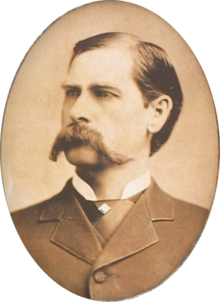 ^ Brooks, Robert L. "Wichitas". Encyclopedia of the Great Plains. University of Nebraska–Lincoln. Retrieved March 21, 2014. ^ Sturtevant, William C. (1967). 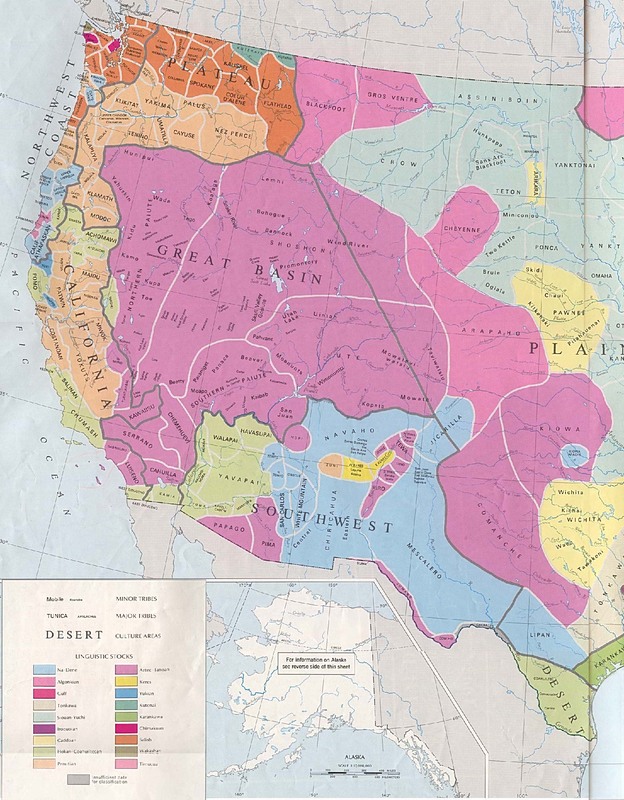 "Early Indian Tribes, Culture Areas, and Linguistic Stocks [Map]". Smithsonian Institution. Retrieved March 21, 2015. ^ "Louisiana Purchase". Kansapedia. Kansas Historical Society. Retrieved March 21, 2015. ^ "Kansas Territory". Kansapedia. Kansas Historical Society. Retrieved March 21, 2015. ^ a b Sowers, Fred A. (1910). "Early History of Wichita". 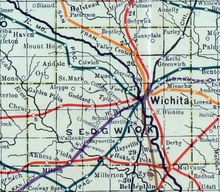 History of Wichita and Sedgwick County, Kansas. Chicago: C.F. Cooper & Co. Retrieved March 21, 2015. ^ a b c "History of Wichita". Wichita Metro Chamber of Commerce. Retrieved March 21, 2015. ^ a b c "Midtown Neighborhood Plan" (PDF). Wichita-Sedgwick County Metropolitan Area Planning Department. 2004. Archived from the original (PDF) on February 5, 2016. Retrieved March 21, 2015. ^ a b c "Delano's Colorful History". Historic Delano, Inc. Retrieved March 21, 2015. ^ "History of Wichita State University". Wichita State University. Retrieved March 26, 2015. ^ "History". Friends University. Retrieved March 26, 2015. ^ a b "Census of Population and Housing". United States Census Bureau. Retrieved March 26, 2015. ^ "Petroleum Refining: A 125 Year Kansas Legacy" (PDF). Kansas Department of Health and Environment. Retrieved March 19, 2015. ^ Tanner, Beccy (January 5, 2012). "Boeing's Wichita history dates to 1927". The Wichita Eagle. Retrieved March 26, 2015. ^ a b "History of the Building". Kansas Aviation Museum. Retrieved March 26, 2015. ^ "Learjet: A Brief History" (PDF). Bombardier Inc. January 2008. Retrieved March 26, 2015. 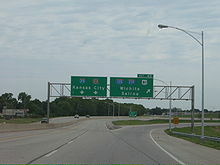 ^ a b c d "Wichita, Kansas". Encyclopedia of the Great Plains. University of Nebraska–Lincoln. Retrieved March 28, 2015. ^ "About Us". Mentholatum. Retrieved March 28, 2015. ^ "First Light (1900-1929)". Coleman Company. Retrieved March 28, 2015. ^ "Bronze Sculpture of Lunch Counter for Downtown Park is Tribute to Civil Rights Activists". The Wichita Eagle. February 4, 1998. Retrieved March 28, 2015. ^ Wilkerson, Isabel (August 4, 1991). "Drive Against Abortion Finds a Symbol: Wichita". The New York Times. Retrieved March 28, 2015. ^ Davey, Monica; Stumpe, Joe (May 31, 2009). "Abortion Doctor Shot to Death in Kansas Church". The New York Times. Retrieved March 28, 2015. ^ "Wichita Downtown Development Corp". OldtownWichita.com. Retrieved March 28, 2015. ^ Neil, Denise (December 6, 2014). "After 5 years, Intrust Bank Arena still battles image problem". The Wichita Eagle. Retrieved March 28, 2015. ^ McMillin, Molly (July 29, 2014). "End of an era: Boeing in final stages of leaving Wichita". The Wichita Eagle. Retrieved March 28, 2015. ^ Siebenmark, Jerry. "Eisenhower's granddaughter helps Wichita rename its airport". The Wichita Eagle. Retrieved March 28, 2015. ^ "2003-2004 Official Transportation Map" (PDF). Kansas Department of Transportation. 2003. Retrieved January 1, 2011. ^ "City Distance Tool". Geobytes. Retrieved January 1, 2011. ^ "Ecoregions of Nebraska and Kansas" (PDF). Environmental Protection Agency. 2001. Retrieved January 1, 2011. ^ "Sedgwick County Geohydrology - Geography". Kansas Geological Survey. December 1965. Retrieved January 1, 2011. ^ a b c d e f g h i "City of Wichita" (PDF). Kansas Department of Transportation. June 2010. Retrieved January 1, 2011. ^ "General Highway Map - Sedgwick County, Kansas" (PDF). Kansas Department of Transportation. June 2009. Retrieved January 1, 2011. ^ Peel, M. C.; Finlayson, B. L.; McMahon, T. A. (March 1, 2007). "Updated Köppen-Geiger climate classification map" (PDF). Hydrology and Earth System Sciences (4): 439–473. Retrieved January 25, 2012. ^ a b "Historical Weather for Wichita, Kansas, United States of America". Weatherbase. Retrieved January 25, 2012. ^ a b c d "Average weather for Wichita, KS". The Weather Channel. Retrieved January 25, 2012. ^ a b c d e "NOWData - NOAA Online Weather Data". National Weather Service Forecast Office - Wichita, KS. Retrieved September 6, 2018. ^ "Station Name: KS WICHITA". National Oceanic and Atmospheric Administration. Retrieved March 10, 2013. ^ "WMO Climate Normals for WICHITA/MID-CONTINENT ARPT KS 1961–1990". National Oceanic and Atmospheric Administration. Retrieved March 11, 2014. ^ a b c d e f "American FactFinder 2". United States Census Bureau. Retrieved November 12, 2011. ^ Thomas, G. Scott (2011). "Metro Area Populations as of July 2011: 2011 - United States -- Metropolitan Statistical Area". 2011 American City Business Journals, Inc. American City Business Journals, Inc. Retrieved April 30, 2011. ^ "Population and Housing Occupancy Status: 2010 - United States -- Combined Statistical Area". 2010 Census National Summary File of Redistricting Data. United States Census Bureau, Population Division. 2010. Retrieved April 30, 2011. ^ "Population and Housing Occupancy Status: 2010 - State -- County / County Equivalent". 2010 Census Redistricting Data (Public Law 94-171) Summary File. United States Census Bureau. Retrieved April 30, 2011. ^ "Hawker Beechcraft secures $40 million incentive package to remain in Wichita". Retrieved January 2, 2011. ^ a b "Wichita Chamber of Commerce". Wichitakansas.org. Retrieved July 15, 2013. 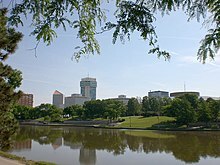 ^ "Wichita, Kansas". City-Data.com. Retrieved March 11, 2015. 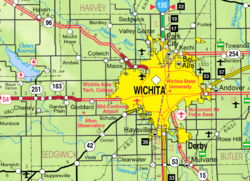 ^ "Wichita must change its thinking to stop decline, start to grow, analyst says". kansas. Retrieved June 12, 2018. ^ "Focus Forward | Strategic Initiatives | Wichita Community Foundation". wichitacf.org. Retrieved June 12, 2018. ^ "Wichita Art Museum Visitor Information". Wichitaartmuseum.org. Retrieved September 12, 2009. ^ "About Us". Ulrich Museum of Art at Wichita State University. Retrieved September 14, 2015. ^ "Riverfest attendance and button sales up, arrests down". kansas. Retrieved June 12, 2018. ^ "Riverfest slowly turning critics to fans with killer concert lineups". kansas. Retrieved June 12, 2018. ^ "Our Building". The Wichita-Sedgwick County Historical Museum. Retrieved September 14, 2015. ^ Keith Stokes. "Coleman Factory Outlet and Museum - Wichita, Kansas". Kansastravel.org. Retrieved July 15, 2013. 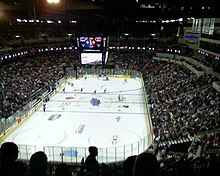 ^ "INTRUST Bank Arena". INTRUST Bank Arena. Retrieved July 15, 2013. ^ "Welcome to Old Town". OldtownWichita.com. Retrieved September 14, 2015. ^ "Moody's Skid Row Beanery by Pat O'Connor: 1960s Wichita, KS Beatniks, Hoboes: Moody Connell Beats In Kansas". Vlib.us. Retrieved July 15, 2013. ^ "Best Places to Live 2006". Money Magazine. 2006. Archived from the original on August 5, 2008. Retrieved August 5, 2008. ^ "2008 MSN Real Estate best bargain markets". MSN Real Estate. 2008. Retrieved August 26, 2008. ^ "Wichita Town". IMDb. Retrieved October 19, 2013. ^ "City of Wichita City Council". City of Wichita. Retrieved March 15, 2019. ^ "City Manager's Office". City of Wichita. Retrieved March 15, 2019. ^ "-Departmental Information". City of Wichita. Retrieved April 30, 2011. ^ "Sedgwick County, Kansas Government". Sedgwick County, Kansas. Retrieved July 30, 2012. ^ "Courthouse Information". U.S. District Court for the District of Kansas. Archived from the original on January 9, 2012. Retrieved August 25, 2013. ^ a b "Locations - Robert J. Dole Department of Veterans Affairs Medical and Regional Office Center". U.S. Department of Veterans Affairs. Retrieved August 25, 2013. ^ "Kansas City Division - Territory/Jurisdiction". Federal Bureau of Investigation. Retrieved August 25, 2013. ^ "Contact My Local Office in Kansas". Internal Revenue Service. Retrieved August 25, 2013. ^ "2012-13 Demographic Snapshot". Wichita Public Schools. October 1, 2012. Retrieved June 12, 2013. ^ "Education". Wichita Metro Chamber of Commerce. Retrieved February 4, 2011. ^ "Classes". Bethany Lutheran School. Retrieved February 4, 2011. ^ "Welcome to Holy Cross Lutheran School". Holy Cross Lutheran School. Retrieved February 4, 2011. ^ "Wichita Adventist Christian Academy". Wichita Adventist Christian Academy. Retrieved February 4, 2011. ^ "Private Schools" (PDF). 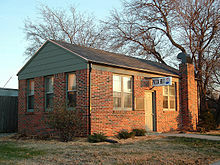 Wichta Metro Chamber of Commerce. Retrieved February 4, 2011. ^ "Wichita State University". College Portraits of Undergraduate Education. Retrieved February 5, 2011. ^ "Friends Fact Sheet". Friends University. Retrieved February 5, 2011. ^ "2010-11 Admission Brochure". Newman University. p. 5. Retrieved February 5, 2011. ^ "School of Medicine". KU Medical Center. Retrieved February 5, 2011. ^ "Education". Wichita Metro Chamber of Commerce. Retrieved February 5, 2011. ^ "McConnell Campus". Embry-Riddle Aeronautical University. Retrieved February 5, 2011. ^ "Heritage College-Wichita". College Navigator. National Center for Education Statistics. Retrieved February 5, 2011. ^ "ITT Technical Institute-Wichita". College Navigator. National Center for Education Statistics. Retrieved February 5, 2011. ^ "Locations & Hours". Wichita Public Library. Retrieved July 24, 2018. ^ "Wichita Eagle". Mondo Times. Retrieved January 15, 2011. ^ "Wichita Business Journal". Mondo Times. Retrieved January 15, 2011. ^ "Wichita Kansas Newspapers". Mondo Newspapers. Retrieved October 24, 2014. ^ "Voice It Wichita.com". TCV Publishing. Retrieved October 24, 2014. ^ "Liberty Press". Mondo Times. Retrieved January 15, 2011. ^ "Backstory". SplurgeMag. Retrieved October 24, 2014. ^ "2009 Arbitron Radio Metro Map" (PDF). Arbitron. Archived from the original (PDF) on July 20, 2011. Retrieved March 14, 2012. ^ "Contact Us". KAKE. Archived from the original on August 17, 2011. Retrieved January 9, 2011. ^ "About Us - kwch.com". KWCH. Archived from the original on July 13, 2011. Retrieved January 9, 2011. ^ "Contact Us - myTVwichita". KMTW. Retrieved January 9, 2011. ^ "Wichita-Hutchinson Television Stations". Station Index. Retrieved January 9, 2011. ^ "Service territory and map". Westar Energy. Retrieved August 13, 2018. ^ "Summary of Cable TV Providers in Wichita, KS". CableTV.com. Retrieved August 13, 2018. ^ "Summary of Wichita Internet Providers". HighSpeedInternet.com. Retrieved August 13, 2018. ^ "About Us". Kansas Gas Service. Retrieved August 13, 2018. ^ "Public Works & Utilities". 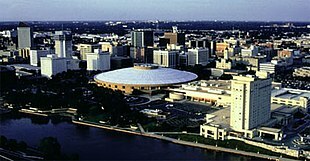 City of Wichita, Kansas. Retrieved August 13, 2018. ^ "Trash in Sedgwick County". Sedgwick County, Kansas. Retrieved August 13, 2018. ^ "Via Christi hospitals". Via Christi Health. Retrieved August 10, 2018. ^ "Locations – KS". Hospital Corporation of America. Retrieved August 10, 2018. ^ Christie, Les (June 13, 2007). "New Yorkers are top transit users". CNNmoney.com. Retrieved June 29, 2007. ^ "KAAO - Colonel James Jabara Airport". AirNav.com. Retrieved January 9, 2011. ^ "KCEA - Cessna Aircraft Field Airport". AirNav.com. Retrieved January 9, 2011. 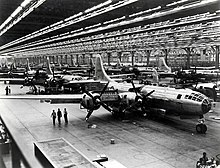 ^ "KBEC - Beech Factory Airport". AirNav.com. Retrieved January 9, 2011. ^ "K32 - Riverside Airport". AirNav.com. Retrieved January 9, 2011. ^ "71K - Westport Airport". AirNav.com. Retrieved January 9, 2011. ^ a b "Getting Around the Metro Area". Wichita Metro Chamber of Commerce. Retrieved January 9, 2010. ^ "UPRR Common Line Names". Union Pacific Railroad. Retrieved January 9, 2011. ^ "Rail Plan 2005-2006" (PDF). Kansas Department of Transportation. pp. 66–67. Retrieved January 9, 2011. ^ Wistrom, Brent (January 11, 2010). "Proposed Amtrak line would mean millions for Wichita". USA Today. Retrieved January 9, 2011. ^ "Thruway Bus Connection ties two Amtrak routes together through Wichita". Amtrak. April 18, 2016. Retrieved March 7, 2017. ^ "Wichita-Sedgwick County Planning Wichita Bicycle Master Plan". www.wichita.gov. Retrieved January 1, 2019. ^ "Wichita builds on bike-friendly status". kansas. Retrieved January 1, 2019. ^ "Koch Industries: Summary". OpenSecrets.org. Retrieved June 10, 2015. ^ "Kirstie Alley". Soylent Communications. Retrieved November 9, 2010. ^ Myrna Oliver (December 4, 2000). ""Gaylord Carter; Theater Organist, Master Composer for Silent Classics"". Los Angeles Times. Retrieved November 25, 2018. ^ Chris Elliott (2001). "Gaylord Carter". American Theatre Organ Society. Archived from the original on April 7, 2007. Retrieved April 28, 2007. ^ "Wichita Sister Cities". City of Wichita. Retrieved July 25, 2018. ^ "Wichita Sister Cities". City of Wichita. Retrieved August 11, 2018. ^ "Atlas français de la coopération décentralisée et des autres actions extérieures". Ministère des affaires étrangères (in French). Archived from the original on February 26, 2013. Retrieved July 13, 2013.